Also writes under pseudonym Stephen Bury. The Baroque Cycle has been published (originally) in a three-volume and (subsequently) in an eight-volume edition. The Big U was written while he was a student at Boston University. Saturday, May 30 at 7PM Bestselling Author Neal Stephenson speaking & signing Seveneves What would happen if the world were ending? A catastrophic event renders the earth a ticking time bomb. In a feverish race against the inevitable, nations around the globe band together to devise an ambitious plan to ensure the survival of humanity far beyond our atmosphere, in outer space. But the complexities and unpredictability of human nature coupled with unforeseen challenges and dangers threaten the intrepid pioneers, until only a handful of survivors remain . . . Five thousand years later, their progeny—seven distinct races now three billion strong—embark on yet another audacious journey into the unknown . . . to an alien world utterly transformed by cataclysm and time: Earth. The speaking portion of this event is free and open to the public. Tickets are required for the signing. Please see below for details. PLEASE READ: The speaking portion of this event is free and open to the public. Tickets are required to join the signing line at this event. Tickets are only available with the purchase of a copy of Seveneves from BookPeople. Purchasing a book online automatically assigns you a ticket for the signing. There is no separate "ticket" item to add to your cart. Books & tickets are now available to pre-order. If you cannot make it to the event, you can order a signed copy. Add the book to your cart and write "SIGNED COPY" in the comments field during checkout. We ship all over the world! ABOUT Neal Stephenson Neal Stephenson is the author of Reamde, Anathem; the three-volume historical epic the Baroque Cycle (Quicksilver, The Confusion, and The System of the World); Cryptonomicon; The Diamond Age; Snow Crash, which was named one of Time magazine's top one hundred all-time best English-language novels; and Zodiac. He lives in Seattle, Washington. ABOUT Seveneves A catastrophic event renders the earth a ticking time bomb. In a feverish race against the inevitable, nations around the globe band together to devise an ambitious plan to ensure the survival of humanity far beyond our atmosphere, in outer space. But the complexities and unpredictability of human nature coupled with unforeseen challenges and dangers threaten the intrepid pioneers, until only a handful of survivors remain . . . Five thousand years later, their progeny—seven distinct races now three billion strong—embark on yet another audacious journey into the unknown . . . to an alien world utterly transformed by cataclysm and time: Earth. Can't make it to the event? You can order a signed copy! Add the book to your cart and write "SIGNED COPY" in the comments field during checkout. We ship worldwide. Thank you for supporting your local independent bookstore! This event takes place at First Parish Church in Harvard Square. Tickets are required. From the #1 New York Times-bestselling author of Anathem, Reamde, and Cryptonomicon comes an exciting and thought-provoking science fiction epic -- a grand story of annihilation and survival spanning five thousand years. Five thousand years later, their progeny -- seven distinct races now three billion strong -- embark on yet another audacious journey into the unknown . . . to an alien world utterly transformed by cataclysm and time: Earth. Ticket purchases must be prepaid. Choose PayPal or credit card at checkout to buy online, or pick yours up in the store. Wednesday, September 10, 7:30 p.m. Hieroglyph: Stories and Visions for a Better Future Tickets are available at Kepler's and online at Brown Paper Tickets. Panelists include Neal Stephenson, Annalee Newitz, Rudy Rucker, Keith Hjelmstad, *Charlie Jane Anders and editors Ed Finn and Kathryn Cramer *newly added panelist! Find out more about Charlie Jane HERE! Is this the new Golden Age of science fiction? Good science fiction has the potential to act as a powerful social force as it did in the late 1930s and early 1940s. It has the power to inspire collaboration with professionals in science and engineering and opens up space for innovation and big ideas without the constriction of data and practicality. Join Neal Stephenson, best-selling science and speculative fiction writer and game designer, and five of today’s leading thinkers, writers, and visionaries for a discussion of the intersection of world-changing art and technology. Hieroglyph: Stories and Visions for a Better Future is an anthology of stories that push the limits of our recognizable reality while avoiding the classic science fiction formula, namely a dystopia or technology that has advanced far beyond any recognizable relationship to our world. Hieroglyph aims to inspire production of new technologies to help solve the problems just beyond our current landscape. Panelists Neal Stephenson, Annalee Newitz, Rudy Rucker, Keith Hjelmstad, Charlie Jane Anders and editors Ed Finn and Kathryn Cramer will discuss Hieroglyph and exciting real-world applications of the science fiction genre. Bestselling Author Neal Stephenson will speak & sign Some remarks: Essays. The speaking portion of this event is free and open to the public. Wristbands are required for the signing portion of the event and are available only with the purchase of a copy of Some remarks from BookPeople. Wristbands will be available as of 6pm the day of the event. #1 New York Times bestselling author Neal Stephenson is, quite simply, one of the best and most respected writers alive. Renowned for his exceptional novels—works colossal in vision and mind-boggling in complexity, Stephenson explores and blends a diversity of topics, including technology, economics, history, science, pop culture, and philosophy. His books are the products of a keen and adventurous intellect. This new collection, Some remarks, brings together previously published short writings, both fiction and nonfiction, as well as a new essay (and an extremely short story) created specifically for this volume. Stephenson ponders a wealth of subjects, from movies and politics to David Foster Wallace and the Midwestern American College Town; video games to classics-based sci-fi; how geekdom has become cool and how science fiction has become mainstream (whether people admit it or not); the future of publishing and the origins of his novels. Thank you for supporting Neal Stephenson and your local independent bookstore! Some remarks is a diverse collection of essays— Neal Stephenson’s first nonfiction work since his long essay on technology, In the Beginning…Was the Command Line, more than a decade ago—as well as new and previously published short writings, both fiction and non. Some remarks includes Neal discoursing on everything from Sir Isaac Newton to Star Wars, to the importance of books. This is a numbered event. Numbers for the signing line are available with purchase of Some remarks from Mysterious Galaxy, on sale beginning Tuesday, August 7, at 10AM. If you are planning to attend the event, please do not place your order through the web site as all such orders are processed after the event. Instead, please call the store and purchase the book over the phone on or after the on-sale date. Reamde is the latest adventure from Neal Stephenson, the critically acclaimed #1 New York Times bestselling author of Anathem and Cryptonomicon. In this return to the terrain of his other groundbreaking books, Stephenson delivers his most accessible novel to date––a high-intensity, high-stakes, action-packed global adventure thriller in which a tech entrepreneur gets caught in the very real crossfire of his own online war game. Four decades ago Richard Forthrast, the black sheep of his Iowa-based family, fled to a wild and mountainous corner of British Columbia to avoid the draft. Quickly realizing that he could make a lot of fast cash carrying backpack loads of high-grade marijuana across the border into Northern Idaho, he began to amass an enormous and illegal fortune. Living an affluent but lonely and monotonous life in Canada, Richard became addicted to online fantasy games. Years later, when amnesty from the government allowed Richard to return to the US, he used his fortune and his skills to become the head of his own major computer gaming group called Corporation 9592 with its own super-successful online fantasy game, T’Rain. But now Forthrast is caught in the center of a global thriller and a virtual war for dominance that begins when international hackers develop a virus called Reamde that unwittingly makes some very evil villains extremely angry. Set in the present-day modern world, Reamde has the global intrigue and suspense of a James Bond movie on steroids. There are Russian mobsters, Chinese spies, Islamic jihadists, hired assassins, computer hackers, online gaming, and enough fear and adrenaline for several Stephenson novels. And Richard's beloved, beautiful, and brilliant niece Zula is in grave danger and caught in the middle of an international nightmare. Now Richard Forthrast, the loner-millionaire-genius, has to figure out how to set things right––without getting himself killed. 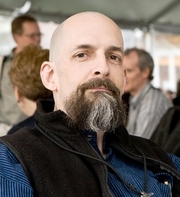 Neal Stephenson is the author of Anathem; the three-volume historical epic The Baroque Cycle (Quicksilver, The Confusion, and The System of the World); Cryptonomicon; The Diamond Age; Snow Crash, which was named one of Time magazine's top one hundred all-time best English-language novels; and Zodiac. He lives in Seattle, Washington. Tickets £3, available from the ground floor desk and redeemable against one copy of the promoted book on the night. A rare opportunity to meet Neal Stephenson, who will be discussing and signing his new novel ANATHEM. Neal Town Stephenson (born October 31, 1959) is an American writer, known for his speculative fiction works, which have been variously categorized science fiction, historical fiction, maximalism, cyberpunk, and postcyberpunk. Stephenson explores areas such as mathematics, cryptography, philosophy, currency, and the history of science. He also writes non-fiction articles about technology in publications such as Wired Magazine, and has worked part-time as an advisor for Blue Origin, a company (funded by Jeff Bezos) developing a manned sub-orbital launch system. Born in Fort Meade, Maryland (home of the NSA and the National Cryptologic Museum) Stephenson came from a family comprising engineers and hard scientists he dubs "propeller heads". His father is a professor of electrical engineering whose father was a physics professor; his mother worked in a biochemistry laboratory, while her father was a biochemistry professor. Stephenson's family moved to Champaign-Urbana, Illinois in 1960 and then to Ames, Iowa in 1966 where he graduated from Ames High School in 1977. Stephenson furthered his studies at Boston University. He first specialized in physics, then switched to geography after he found that it would allow him to spend more time on the university mainframe. He graduated in 1981 with a B.A. in Geography and a minor in physics. Since 1984, Stephenson has lived mostly in the Pacific Northwest and currently resides in Seattle with his family. The Baroque Cycle has been published (originally) in a three-volume and (subsequently) in an eight-volume edition. The Big U was written while he was a student at Boston University. Neal Stephenson's book Seveneves was available from LibraryThing Early Reviewers. Neal Stephenson's book Reamde was available from LibraryThing Early Reviewers. Neal Stephenson's book Anathem was available from LibraryThing Early Reviewers. Neal Stephenson is currently considered a "single author." If one or more works are by a distinct, homonymous authors, go ahead and split the author. Neal Stephenson is composed of 17 names. You can examine and separate out names.